A Black Cherry MX clone made by Kaihua in China. While K-switch quality came under fire early, later tooling claimed major improvement. Easy for me to rank this high up in typing. Great feel with a smooth travel down and a fairly quiet actuation. However, it isn't a red, so don' expect to go pro with a black switch. Its simply amazing to use. This is the worst switch that I have ever used. I found that compared to the black cherry mx that felt wobblier. However, be warned that I am not a fan of the black switch at all. Still, I think Kailh has the most offensive. 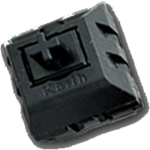 Have experience using Kailh Black switches? Add a review to share your knowledge with the keyboard community.